If you read here, you’ll know we love game mechanics, and we tend to talk about that a lot. See what I did there, just gamed search engines. Anyway, for no real reason, I’ve decided to pen a post on questing, which in this case, refers to adding a set of steps that create an incentive for your users to add information to a system. Everyone is familiar with questing from games; it’s a long arc, achieved by completion of many short arcs, and there’s a reward at the end. Ever played Super Mario Brothers or Donkey Kong? What about Risk? Like I said, everyone knows questing. So, how does this game mechanic fit into software design? Here are two examples. 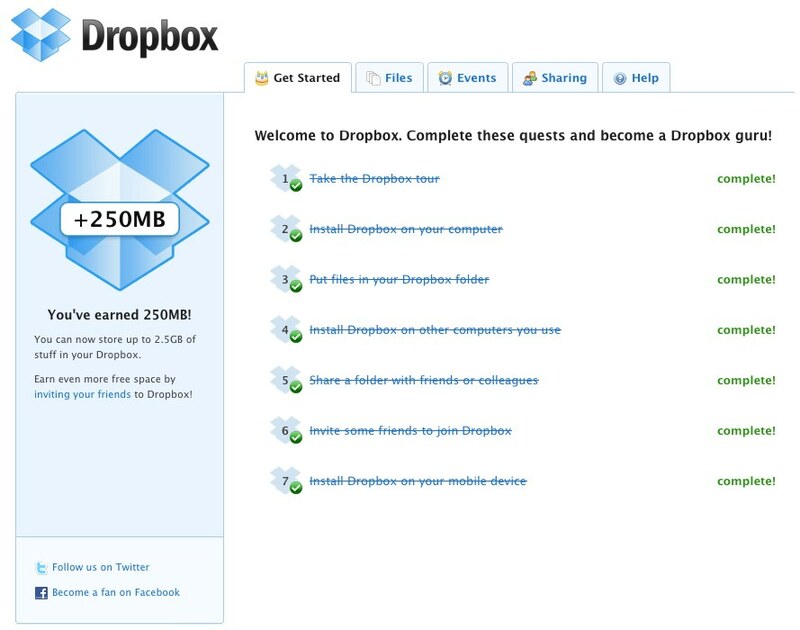 Dropbox is one of our favorite tools. They use a simple quest with a reward, 250 MB of free storage. Dropbox offers you a reward, i.e. more free storage, in exchange for completing several small tasks. They even elevate you to Dropbox guru. Not that this is reflected anywhere as a badge, not yet anyway, but it’s clearly part of the quest. This is a classic win-win quest that also benefits the service; the minor tasks–installing the native clients, spreading the word, adding and sharing files, taking the tour–all force you to familiarize yourself with the service, which is how you find value and stick as a user. Dropbox didn’t have this when I started using it back in 2008, but obviously, someone has been paying attention to trends. I wonder how much of their recent success in attracting users can reasonably be attributed to adding a quest. Dropbox has dabbled in other quests too, recently offering users a scavenger hunt called Dropquest for more free storage and other prizes. LinkedIn offers an older example of a quest that is probably more familiar, profile completeness. I completed my profile long ago for no reason other than to move that progress bar. I remember once I started the quest, I had to finish it. Over the years, they have tweaked the completion process and made it more transparent, adding new features to the process, like profile pictures, that benefit their overall service. As with Dropbox, this quest is win-win. LinkedIn benefits from having more complete profiles. They have emphasized profile attributes that make their service more valuable to their users, especially the paying customers. As a freemium service, LinkedIn offers tiered subscriptions, and profile completeness offers a way to vet profiles. While LinkedIn doesn’t actively encourage vetting by profile completeness, it does provide a quick way to determine how engaged the user is. Aside from a maniacal desire to get to 100% complete, the user also benefits by vetting. Right-wrong-indifferent, profile completeness is used by recruiters and other users to judge your LinkedIn profile. A quick search reveals just how important that simple quest is to recruiters. So, there you have two quests. I’m a fan of adding quests to UX because, when done right, they’re mutually beneficial and engaging without feeling like forced gamification. Plus, quests can also benefit a broader range of goals for a service without looking cheesy, and they have an end. Not everyone wants to earn badges for performing tasks, and even for those of us driven by bling, the game tends to get dull after a while, especially with no end in site. Have you seen quests in other software/services? Share them in comments. Funny you should mention linkedin in this context – I felt the gamification, and did not like it one bit. That started me off with a bad taste in my mouth. Their so easily borked UI made it as tasty as chopped liver. No matter how often my mother said “I thought you loved chopped liver” I never did. Loved risk in college, never had too much patience for roomate’s D&D or later, hunt the wumpus. So, you don’t like quests, or you don’t like the application of quests to non-games? Perhaps both 🙂 Insert get-off-my-lawn here. Iffy about quests, don’t like feeling gamed. I’m nosey. Have you seen much (any) material on gender and gamification. Are there aspects which appeal or disengage men vs women. Collecting (such as achievements) and competitiveness both have male “tendencies”. I wonder if there are other aspects that might act the other way. PS. Have you looked at OkCupid from the game mechanics point of view. Lots of interesting stuff there. They have a blog, but it is more focussed on their data rather than the engine. Well, life is a game really. We’re all just players. I’ve seen some research on game mechanics and gender; I assume Amy Jo Kim has thoughts in that area. You could probably find her research with a quick search. I hadn’t heard that collecting was a male tendency, but competitiveness is classically male, although I think that has changed over the last generation or two. Love OkCupid’s blog. Their data posts are awesome, albeit statistically dubious in some cases. Aside from their data blog, I haven’t seen any game mechanics discussed. Details? Saw that, definitely not good behavior. Their whole security snafu wasn’t nice either. Still, love the service.